You should always PRIORITIZE planning for your retirement before you planning for your kids college! Why? Well 100% of you are going to retire at some point but what percentage of your kids are going to go to college, 50%, 60%?? Who knows the real number, all I know is the last thing you want to do is save a ton of money for college before taking care of your retirement. What if little Johnny wants to become a plumber? There’s nothing wrong with that, but if I saved for college before my retirement I could be left with a huge college plan and no retirement, looking at penalties for not using the college plan for college!! There are two types of 529 plans, the savings plan, and the prepaid plans. It is a way to save for college, but each have some different rules and way they are handled. It is an investment type account (the savings plan 529) that has money that grows tax free, just like a ROTH, if used for qualified education expenses. You can contribute $15,000 (2018 limit) per person, per kid (this amount is tied to the gift tax) This means that I can give my kiddo the max amount, as can my wife, grandma, grandpa, ect. “the grandparent rule” as it is oftentimes refereed, allows someone to make a one time $75,000 contribution, but they can’t contribute again for 5 years. So everyone go ask grandma and grandpa…just kidding!! No income limits so it doesn’t matter how much you make, you can contribute to this. No age restriction, so you don’t have to use it up by age 30. This also means you can gift it to yourself or your spouse for use in going back to college. The PRE-PAID plan allows you to prepay any tuition, but you must pay close attention to the rules and fine print associated with it. They may not honor the pre-paid tuition depending on the rules (double ouch) The last thing you want happening is little Johnny leaving your state for your hated college rival. As you can probably tell I’m not a big fan of the pre-paid plan. You are basically keeping up with college inflation (the stock market average over time is higher than the college inflation rate), and I’m scarred (rather my wife more so) that my kiddo will rebel against my wife’s college of choice (As she yells Go Red Raiders Texas Tech) and cross state lines to go to a rival college. That’ll make Thanksgiving dinner interesting!!!! For more information about any of these college savings plans always refer to the one and only www.irs.gov for the most up to date rules and definitions, where you can learn all kinds of fun things about each of these accounts by searching “529” ect. in the top right search box!! 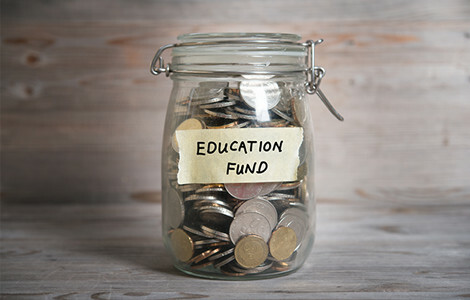 Starting a college fund is easy. There are tons of discount brokerage sites out there like TD Ameritrade, Fidelity, Schwab, ect. that will allow you to open up these accounts and best of all they’re usually free of management fees.